Exciting News - We are now a Level 1 School! Thank you so much for hosting Chris's visit today. She had a lovely time in school and was particularly impressed at the passion and enthusiasm for rights displayed by pupils and staff across the school. I know you've worked very hard to get to this point so please keep up the fantastic work and we look forward to supporting your move to Level 2. Congratulations to all pupils and adults of Vane Road Primary on achieving the Level 1 Rights Respecting Award. We delivered a lecture at the School of Education at Durham University. Here are some of our pictures and a video taken in the Lecture Theatre. We delivered a Lecture at Durham University! Yesterday Poppy J, Jack H and Harriette P some of our Rights Respecting Ambassadors helped Miss Wren to deliver a Lecture about Rights Respecting to over 100 PGCE Students at Durham University. The children wrote their own notes and spoke clearly and eloquently. The Students were so impressed that each child received a huge round of applause and a goody bag. They were great ambassadors for our school, well done! We were nominated for the Innovation Award in this year's Northern Echo Education Awards and have reached the finals. We appeared in the Northern Echo on Tuesday February 28th, 2017. For further details please read the article below. Here are some of our new Class Charters. Photographs taken by Heston Class 14 and Niall Class 13. All of the Rights Respecting Ambassadors were voted onto the Rights Respecting Team by their Classmates. Visit from King Street Primary School. We had a very exciting visit from King Street Primary School's Rights Respecting Team. It was great fun showing them around our school, sharing our Class Charters and presenting a PowerPoint all about our journey to becoming a Rights Respecting School. The visiting children were particularly interested in the changes that we have made around our Lunchtimes. It was very interesting talking to them about the similarities and differences in our schools. They thought our school was enormous and liked the idea of having two classes in each year group and having a school dog! They then invited us to visit their school the following week and we will report back on this visit, we are really looking forward to it. We had a very interesting time visiting King Street Primary School and looking at their wonderful Class Charters and meeting their Rights Respecting Team. We watched a presentation which informed us of all the things that they do as a school as part of their Rights Respecting Award. I really liked the idea of the children being able to choose and vote for the topic that they wanted to study each term, They also had an exercise bike where the childen were cycling 10,000 km the distance to Rio de Janeiro which I had a go on. We visited all of the Classrooms and they had some amazing displays, it was a really fun morning. Ben Class 14. Article 24 - Children have the right to nutritious food, clean water and a safe environment. When the children completed their questionnaires about how we could improve our school Lunchtime was mentioned many times. The mess left on the floor, the noise level and lack of manners were some of the main issues. The Rights Respecting Team have held several meetings about how to address these issues. After a great deal of discussion we are trialling the following systems. Every day we will be monitoring the amount of rubbish left on the floor using a Traffic Light System, if there is very little a point will be awarded. When we reach 10 points the children will be given an extra 5 minutes playtime on a Friday. Each day a member of staff will be on duty and will be awarding 2 certificates to the children who display excellent manners and behaviour during lunchtime and will be invited to sit at the Top Table on a Friday. The noise level in the hall will also be monitored and the children will be rewarded accordingly. 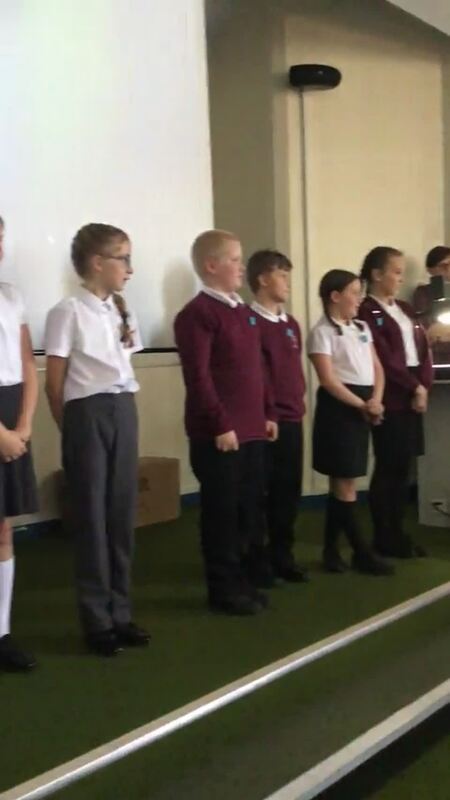 A Lunchtime Charter has been created by the Rights Respecting Team and this was shared in Assembly. The Charter is displayed in the Main Hall for the children to look at and remind themselves of their Rights and how they show respect for these. We really hope that these changes will create a more enjoyable and calmer lunchtime. Visit to Renaissance International School - Ho Chi Minh City - Vietnam - Miss Wren. I had the great privilege of visiting the above school during the October half term and I was very impressed with their environment and their Rights Respecting ethos. We hope to work with the school on some joint projects in the future and I will keep you posted of any activities that we particpate in. We received a letter of thanks from Alison Bellwood the Programme Director of The World's Largest Lesson for participating in this Global Event. Here at Vane Road Primary School we are beginning the journey to become a Rights Respecting School. The children and staff will be working together to understand the importance of rights and how to respect these. We will be nominating Ambassadors across the school very soon who will be central to demonstrating the inclusiveness of a rights respecting school and the benefits that come from this. More positive attitudes towards diversity in society and the reduction of prejudice. Pupils' development as global citizens. Active child participation is a key characteristic of the award. Being involved in the Rights Respecting School Award (RRSA) means that your child can become more involved in decisions about how their school is run. All around the world children are being denied access to basic things like healthcare, education and safe water to drink. Working towards the Rights Repecting School Award will make our children more aware of their rights and responsibilities within the local community and the wider world. They will learn that other people around the world don't always have the same benefits as themselves. The Rights Respecting School promotes the UN convention on the rights of the child (UNCRC). This is an integral part of our ethos and vision; that children achieve most when they feel included and valued. We want children to learn about their rights and feel empowered about their education. There are 42 articles in the Convention, there is a link below if you would like to see a description of each Article. Education must develop every child's personality, talents and abilities to the full. It must encourage the child's respect for human rights, as well as other cultures and their environment. A Rights Respecting School also supports children in becoming global citizens. We recognise that rights and responsibilities are equally balanced and encourage our children to take responsibility for their actions in order to develop an awareness of how they might affect the rights of others. The aim is to help children achieve their potential and become responsible citizens. Learning and managing a rights respect school. Teaching and learning about the Convention. Creating and maintaining a rights-respecting ethos. Empowering children and young people to become active citizens and learners. How do children learn about their rights? Children learn about their rights by becoming familiar with the United Nations Convention on the Rights of the Child (UNCRC). Children learn the value of a rights based culture by experiencing learning in a community where adults take responsibility for ensuring that all children enjoy their rights. Children take on leadership roles such as House Captains, Buddies, Play Leaders and through the development of a Rights Team (R Team) . They play a full and active part in the decision making processes that help improve the education provided by the school. The teaching of rights lend itself to many subject areas including Literacy, History, Geography, RE, Science and of course PSHCE. All teachers have received training on how to incorporate rights based lessons into their planning and the benefits of a rights respecting ethos throughout the whole school. Children who learn about their rights and responsibilities are more respectful of the rights of others. They show better understanding of what it means to have rights and responsibilities, have more positive attitudes to school and better relationships with others. We have created a Playtime Charter where the children had the opportunity to choose the rights and then discussed how we respect those rights. All of the children now enjoy playing with the playground toys, participating in child led games, using the trim trail and enjoying a game of basketball or netball . All of our classes have now created a Class Charter, the children chose the rights that appealed to them and discussed how they would respect these rights and how the adults in school would also respect these rights. They then chose a class theme and the following charters were created and I must say we have some very creative staff!